This week, Kriete joined more than 30,000 other public educators in the Los Angeles United School District on the picket line. On Monday, educators represented by the United Teachers of Los Angeles called the district’s first strike in 30 years after negotiations with the LAUSD failed to produce a satisfactory contract. Affecting around 600,000 students, it’s one of the largest labor actions by teachers since a walkout by West Virginia educators in February set off a wave of teacher protests nationwide. While their contract dispute actually predates the Red for Ed movement, as the walkout wave has come to be known, L.A. teachers have adopted the movement’s red shirts and use of the #RedforEd hashtag. Like educators in many other parts of the country, those striking in L.A. cite low pay as an important concern — particularly because their city is such an expensive place to live. However, an intense debate over charter schools distinguishes this action from other entries in the Red for Ed ledger. Educators like Kriete are deeply critical of the school district’s favorable stance toward the charter-school movement, and link their overcrowded classrooms and under-resourced campuses to a district preference for charters over traditional public schools. The strike is thus rooted in a long-running battle over the explosive growth of charter schools in L.A. The state of California enthusiastically bought into the charter-school movement, and has become so associated with charters that its parent trigger law, which allows the parents of students to initiate a process that converts a struggling public school into a charter school, helped inspire a widely panned 2012 film starring Maggie Gyllenhaal and Viola Davis, Won’t Back Down. Six years after Won’t Back Down screened at the Democratic National Convention in Charlotte, North Carolina, Los Angeles now has 138,000 students enrolled in charter schools, the highest number in the country. UTLA now seeks to correct what they see as the city’s long-term neglect of its traditional schools. The union is calling for lower class sizes, more support staff like school counselors, librarians, and social workers, and better regulation of the city’s charter schools, which have proliferated despite high-profile cases of fraud and poor academic performance. Charter-school educators, it should be noted, have their own complaints. On Tuesday, UTLA announced unionized staff at The Accelerated Schools have declared a strike too — the nation’s second ever against a charter-school operator — and would join their peers on the picket line. 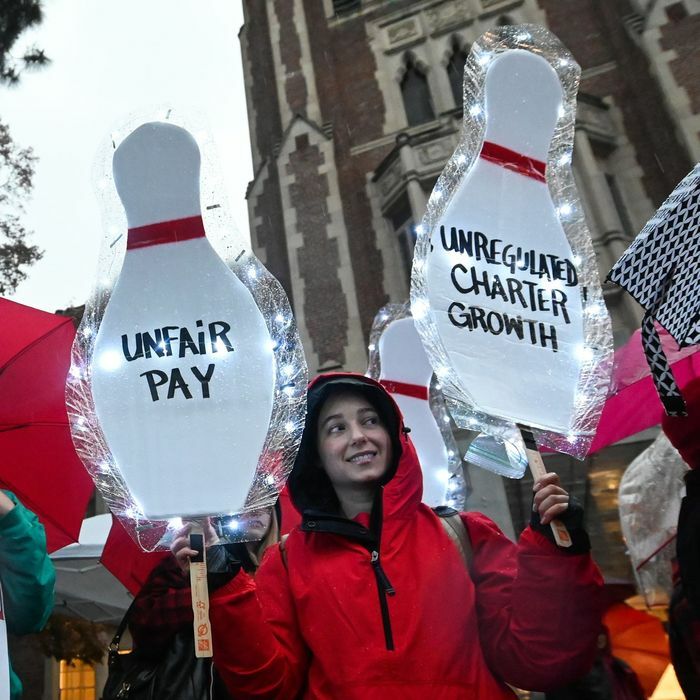 UTLA’s demands put the union sharply at odds with the LAUSD school board, which has been controlled by charter-school operators and advocates for the charter-school movement since 2017. That shift in the board’s makeup owes directly to the efforts of wealthy charter-school backers who, according to Governing magazine, spent around $9.4 million to get two new charter-affiliated officials on the board. The district’s current superintendent, Austin Beutner, is a former investment banker who briefly served as deputy mayor in 2010, under then-mayor Antonio Villaraigosa — himself a former labor organizer turned charter-school advocate who once accused UTLA of being an “unwavering roadblock to reform.” As the Washington Post reported at the time of his appointment last July, Beutner has no experience in education or school administration. Like the school board officials who appointed him, however, he does have strong links to the charter-school movement — and that worries UTLA members. Beutner has said that the strike is not “a referendum on charter schools.” But the union’s demands for better charter-school regulation and a cap on charter-school growth are related inextricably to its plea for more funding for traditional public education. A 2016 study commissioned by UTLA from MGT of America estimated that charter schools cost LAUSD around $500 million annually and that at the time, the oversight fees paid by charters to the school district did not cover the annual operating budget of the city’s charter division. One analysis of that study, produced by the Partnership for Working America’s project In the Public Interest, concluded that traditional public schools faced a net loss of $4,957 in state funds for every student that left to attend a charter school. LAUSD currently has unrestricted financial reserves of nearly $2 billion, but the district and the union remain far apart not just on the charter-school question, but on specific strategies to reduce class size, which would require LAUSD to hire more staff. Russom, who serves on UTLA’s board of directors, added, “We have some of the highest class sizes in the nation and we serve 85 percent black and brown students. We serve 80 percent low-income students. Our students need a lot of support to improve their skills. And it’s just not respectful of me as an educator or of them as students to think that I can give all 40 or 42 or 45 the support they really need.” Russom added that in her experience, the students who leave her classroom to attend charter schools are students who “tend to be from families where they have a little bit more time and a little bit more resources and it tends to be the higher achieving students.” In Los Angeles, severely disabled students are also much more likely to attend traditional public schools, not charters, and traditional schools therefore bear the bulk of the district’s special education costs. UTLA is seeking to remedy the situation by demanding the removal of Section 1.5 from their contract, which caps class sizes at 39 students in most secondary schools and 33 students in most elementary schools. The same section also allows the school district to bypass those caps, and as a result, class sizes often exceed what should be the maximum allowable limit. The district’s most recent counter-proposal allocates $130 million to reduce class sizes through the hiring of new teachers and support staff, but suggests replacing Section 1.5 with a clause that revises maximum class-size caps to 46 students in some secondary schools — while still allowing the district to bypass the caps if certain economic trigger conditions are met. Jeff Good, UTLA’s executive director, told New York that the union believes the triggers are easy to meet, and would allow the district to once again bypass set class-size caps the way it has for the past two decades. “We call it Section 1.5 on steroids,” Good said. Pedro Salcido, LAUSD’s director of policy, disputed UTLA’s characterization of the district’s proposal. “It’s factually incorrect that we want to raise class sizes,” he told New York on Monday. According to Salcido, the district’s counter-proposal revises the class-size cap to reflect current class-size averages. It would not raise class sizes, in other words, but keep them as they are — unless economic factors demand otherwise. Salcido says the triggers are open to negotiation. “Look, we’re willing and ready to negotiate when they are,” he said. “It takes two to negotiate and we’re here and ready to do that.” But on Wednesday, as teachers walked out for a third day, chances of compromise seemed slim. The district has consistently maintained that its cash reserves are already pledged to other needs, and in a Monday Wall Street Journal editorial that omitted any mention of charter schools, Beutner argued that the district’s hands are tied until the state government allocates more funds for the school district. Teachers, meanwhile, told New York that they dread being away from their students. But they’re prepared to stay on the picket line until they can agree on a contract, and emphasize that they’re fighting for more than better working conditions. Low pay and crowded classrooms don’t just harm teachers, after all; they undermine student learning-conditions, too. Good, UTLA’s executive director, told New York on Monday that the strike is a “righteous struggle” for the future of public education in Los Angeles. On Tuesday, UTLA members and supporters clearly identified the forces they believe they’re struggling against: Tens of thousands of educators took their protest to the headquarters of the California Charter Schools Association. Striking charter educators from The Accelerated Schools joined them. A quarantine order has been issued for students and staff at two Los Angeles universities who may have been exposed to measles and either have not been vaccinated or can’t verify that they have immunity. The University of California, Los Angeles, said that as of Wednesday there were 119 students and 8 faculty members under quarantine. The number of those quarantined at California State University, Los Angeles, is not immediately known. This was not the flawless, forward-looking campaign launch that Joe Biden really needed, and it may presage future problems. Biden’s campaign launch will take him to a union hall — and a high-dollar fundraiser hosted by a union-busting lawyer and lobbyist for Comcast. Maybe primary voters should take their own pledge to avoid candidates who won’t pledge civility and unity. Is Biden built to last? After weeks of anticipation and a last-minute scramble to figure out how he wanted to launch his campaign, Joe Biden released a YouTube video that marked his leap into the 2020 presidential race. In the three-plus-minute clip, Biden focuses his energies on Charlottesville, contrasting Thomas Jefferson, and his wise-but-flawed words, with the white nationalist groups that roamed the city and incited violence in 2017. Biden stresses that “America is an idea,” one that has been perverted by our current president and his tolerance for intolerance. What was your first-blush impression of Biden’s entry into the race? He’s clearly not going to compete with Warren for the wonk vote. I thought it was smart — just what the Get Out dad wants to hear. Let’s go back to a time when you weren’t racist because you voted for Obama twice. The interesting thing here is the massive gulf between him and the other candidates on the question of, well, Trump. Biden is clearly making a “let’s go back to when everything was great four years ago” pitch, whereas almost everyone else is now arguing that Trump is part of the problem, not the whole problem, and that the *system* needs fixing. The vision Biden articulated, basically, is 2015. Which might be exactly what a ton of voters want! Yeah. This message is not particularly appealing to disillusioned young lefties, but do you think it will resonate among the older, more moderate voters who will have a huge role in determining the nominee? Yeah, as a person who is reading the work of elite political journalists all day, I now subscribe to the “Trump is a symptom of a larger problem” view. But pre-Trump, even I was much more complacent, and I think Biden’s message is really going to resonate with a lot of voters who are appalled by Trump but not paying a ton of attention to deeper issues he’s surfaced. We’re also in a humming economy, so “everything is terrible and needs to be fixed” is a slightly tougher message to put out there. Right. Should we talk about reparations? Yeah. But is that the kind of debate the average voter wants to get into? I highly doubt it. Easier to pretend the problem was 100 percent Trump. Maybe it’s because I just wrote a piece that stresses Biden’s strategic flexibility, but it could also be that the thematics of this announcement are kind of a placeholder, until he figures out whether he’s a Candidate of Party Unity or a Fighting Moderate. Right. We’re obviously reading a lot into one day of messaging here, but there’s no question that he’s going to play heavily on the “hey, remember me from the Obama years?” factor. His campaign website refers to the “Obama-Biden Administration.” Which isn’t what I usually called it. Among most Democratic voters, that’s the fondest recent memory of politics they have.It’s a very basic, obvious appeal. It’d be malpractice for him not to lean into it. I think Obama did him a huge favor in the last month of his presidency. The only moment I really remember from an Obama State of the Union was him surprising Biden with the cancer moonshot. Then he gave him the Presidential Medal of Freedom. That really cemented the idea that they were BFFs, not just the rare president/VP who didn’t clash. Those moments also came as a lot of Democrats were traumatized by Trump’s election and clinging to every last bit of Obama-y goodness. I had forgotten that. Bet I’ll be reminded of it a lot by Jo 2020. What is up with that logo? I like it! But that’s what I *would* say. It’s on message, in that it’s a copy of the Obama O. Another factor Biden will be leaning on, beyond Obama nostalgia, is institutional support. Gabe wrote yesterday that his game plan is basically to accrue endorsements and overwhelm the field with his Establishment backing. Historically, endorsements have correlated heavily with a candidate’s electoral viability. But in this vast field, with an anti-Establishment candidate vying with Biden for front-runner status, will they have the power they once did? I get the feeling Joe Biden is fine to have us talking about his logo and his role in the Obama years instead of how out of step he *may* be with the modern Democratic Zeitgeist, if not actual primary voters. Re: Endorsements — no! They almost never matter on their own, and the number that Biden has only serves to highlight that Obama’s isn’t on that list. But they do send a pretty big signal: that he’s the institutional guy. Endorsements don’t really mean much any more (cf. Jeb! 2016). But if he’s smart about collecting them from, say, African-American electeds, it could reinforce his credentials as a Party Unity figure rather than the candidate of old folks and nostalgics. You’re forgetting all about Michael Avenatti’s endorsement. They should have paid him not to do that. A lot of political experts seem to think Biden’s fron-runner status isn’t sustainable, for various reasons — his age, his voluminous baggage on issues from Anita Hill to the ‘90s crime bill to protections for the credit card industry, his general out-of-stepness with the progressive movement. It’s obviously very early, but none of this has yet moved the needle on his support, which remains solid. Do you think this stuff will end up hurting him as more voters find out about it? Or is it his propensity for gaffe-heavy campaigning that is likely to be more damaging? OR, will he overcome both of these hurdles and just sail to the nomination? I think people feel they know Biden, and it’s going to be hard to shake the opinion they had of him for eight years. Like, were people very pro-Hillary and they changed their minds when they found out about the “superpredators” comment? I’ve been surprised by how little the barrage of reminders about Biden’s past and his “handsiness” have affected his standing; they haven’t mattered at all. And no, it’s not quite like Hillary, because Biden’s heresies were more extensive and long-standing. Trump is even worse than Biden on many of the issues that comprise his baggage. But that won’t stop him from attacking on those issues. No, he showed that by repurposing the Bernie lines about Clinton. I think the Anita Hill stuff is going to be the toughest for Biden. People got a visceral reminder with the Kavanaugh hearings, whereas the busing issue is more confusing. People might feel the statute of limitations has passed on stuff he did many decades ago, but Anita Hill still feels relevant today, and his answer has been so weak. It’s possible there’s just some sort of lag time here, and it also may depend on whether other candidates start bringing it all up. I mean, if Kamala Harris went after Biden over some of this stuff in South Carolina, it would be hard to ignore. At present, though, I think Biden should be satisfied that he’s survived a pre-candidacy assault that might have destroyed lesser pols. So he can at least maintain the option of running as a unity figure rather than as the Enemy of the Socialist Takeover. Former Vice President Joseph R. Biden Jr. called Anita Hill earlier this month to express his regret over “what she endured” testifying against Justice Clarence Thomas at the 1991 Supreme Court hearings that put a spotlight on sexual harassment of women, according to a spokeswoman for Mr. Biden. But Ms. Hill, in an interview Wednesday, said she left the conversation feeling deeply unsatisfied and declined to characterize his words to her as an apology. She said she is not convinced that Mr. Biden truly accepts the harm he caused her and other women who suffered sexual harassment and gender violence. “I cannot be satisfied by simply saying I’m sorry for what happened to you. I will be satisfied when I know there is real change and real accountability and real purpose,” she said. The white nationalist had a kill list of prominent Democrats and journalists. - Judge ruled Lt Hasson’s charges are NOT suitable for detention. Taking money away from low-performing hospitals could harm the patients she wants to help. Americans are among the most stressed people in the world, according to a new survey. And that’s just the start of it. Last year, Americans reported feeling stress, anger and worry at the highest levels in a decade, according to the survey, part of an annual Gallup poll of more than 150,000 people around the world, released on Thursday. LANSING, Mich. (AP) – Federal judges say Michigan congressional, legislative districts unconstitutionally gerrymandered; order redraw for 2020. BREAKING: Federal judge agrees to release Coast Guard Lt. Christopher Hasson, who was accused of plotting terror attack by federal prosecutors. Judge says govt. has not charged him with terrorism and murder and doesn’t plan to, so no grounds to hold. So did he apologize or not? Despite news that the FTC is preparing to levy the largest fine ever against a tech company, Facebook’s stock price rose this morning. At a Twitter all-hands meeting on March 22, an employee asked a blunt question: Twitter has largely eradicated Islamic State propaganda off its platform. Why can’t it do the same for white supremacist content? With every sort of content filter, there is a tradeoff, he explained. When a platform aggressively enforces against ISIS content, for instance, it can also flag innocent accounts as well, such as Arabic language broadcasters. Society, in general, accepts the benefit of banning ISIS for inconveniencing some others, he said. In separate discussions verified by Motherboard, that employee said Twitter hasn’t taken the same aggressive approach to white supremacist content because the collateral accounts that are impacted can, in some instances, be Republican politicians. The employee argued that, on a technical level, content from Republican politicians could get swept up by algorithms aggressively removing white supremacist material. Banning politicians wouldn’t be accepted by society as a trade-off for flagging all of the white supremacist propaganda, he argued. Why Won’t Twitter Treat White Supremacy Like ISIS? Because It Would Mean Banning Some Republican Politicians Too. North Korea hit the U.S. with a bill prior to releasing the student, who died shortly after returning home. Biden can campaign as a unity candidate, or as the leader of a “moderate” faction. But he has no margin of error. They’re lying to you — but also maybe to themselves. OSHA has just 875 safety inspectors to cover 9 million workplaces, making the task of protecting U.S. workers’ health and safety even harder. Biden’s launch video promises to bring voters back to a simpler time, when America’s racism was subtle, and its national myths a bit more plausible. Biden’s deputy campaign manager says @JoeBiden asked @BarackObama NOT to endorse him, so he could make the case himself. Joe Biden has hired Symone Sanders, a prominent African American political strategist, as a senior adviser to his newly launched presidential campaign. The move adds a younger, diverse voice to Biden’s cadre of top advisers, which has been dominated by older white men. It suggests Biden is seeking to broaden his appeal to a new generation of Democrats. Sanders, 29, rose to prominence during the 2016 campaign as press secretary for Vermont Sen. Bernie Sanders. She then became a high-profile political analyst on CNN and is likely to be a forceful Biden defender on television. I am extremely happy that @JoeBiden has decided to enter the race. He offers Dems the very best chance in 2020, especially in key states. He has the fight, intelligence and fortitude to beat Trump and begin to make America, America again. He has my enthusiastic support. President Donald Trump may successfully drag out many of his legal battles with Congress beyond 2020, denying Democratic investigators much, if any, political bounty before the next election. With Democrats pressing on multiple fronts, from demanding Trump’s tax returns to seeking the testimony of current and former administration officials, some Trump allies see a White House working to buy time. Administration lawyers have rejected a variety of Democratic requests and subpoenas, taking steps that seem to ensure protracted legal battles, which past presidents have used to run out the clock on their congressional adversaries. Is this because nobody talks on the phone anymore? The National Security Agency has recommended that the White House abandon a surveillance program that collects information about U.S. phone calls and text messages, saying the logistical and legal burdens of keeping it outweigh its intelligence benefits, according to people familiar with the matter.